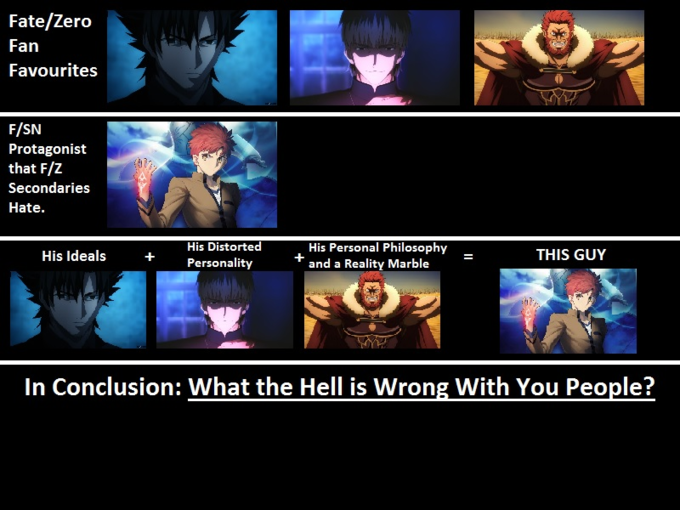 This post has spoilers for Fate/Stay Night and Fate/Zero. If you do not wish for certain information regarding plot points from this series or other related series to be revealed to you, you might want to consider not reading any further. Before I even begin this post, I need to thoroughly apologize for the delay between this post and the last. It’s been a crazy couple of weeks between exams, interviews and real life and I just haven’t had the time I needed to do these last two episodes of the series justice. I saw both ‘The Last Command Spell’ and ‘Fate/Zero’ back to back and I think it’s simpler to digest the episodes together since it is only collectively that they offer the closure and resolution of a finale. The two episodes really should have been combined into a single hour long festival of crushed dreams and shattered ideals; no one came into this series expecting sunshine and rainbows but neither had I expected to see a man’s spirit snapped in two like a particularly frail twig. The first episode, ‘The Last Command Seal’ draws the audience in by revealing the Grail’s true nature to the audience and the futility of Kiritsugu’s lifelong struggles while ‘Fate/Zero’ finishes the job off with an emotional sucker punch that is just designed to leave you empty and reeling for a while. This post will be a long one, but I have attempted to have some semblance of order and flow into it so that it’s not just one big blob of incoherent musings. Throughout these discussion posts over the past few months (time flies, does it not? ), I have shied away from really diving into the philosophical mess that is Emiya Kiritsugu. This was not because I had nothing to say about the character – quite the opposite, as you will all see in just a few moments – but because I wanted to see how the series rewarded or, as was more likely, punished him for the ideology that he operated by. It just made sense to me to hold off on commenting on Kiritsugu’s approach to his impossibly Herculean task of saving humanity until he himself reached a conclusion because his response to said conclusion would speak volumes about his character as well. Emiya Kiritsugu’s operating principles have always been based on simple but utterly ruthless utilitarianism; the many before the few, no exceptions. As an audience, I think I can speak for all of us in saying that we always thought, in our heart of hearts, there were some exceptions, that when it came down to it, even a man as damaged as Kiritsugu would make exceptions for his loved ones. Perhaps the episode of him shooting down Natalia’s plane should have warned us; the many before the few, no exceptions. It is hard to overstate how much I enjoyed the resolution to Kiritsugu’s arc in this series. It might sound cruel of me to take such pleasure in the absolute demolition of a man’s spirit, but honestly, the way that the Grail systematically and rationally tore Kiritsugu’s fragile principles to shreds was so elegantly done that everything that followed felt a totally natural response to what had just transpired. Throughout the series, we have seen Kiritsugu’s cold pragmatism slice through the untested idealism of characters like Saber and Lancer and that has been a part of what made the character so appealing to me; he walks the talk. Whether his specific brand of talk is worth walking is a question that ‘The Last Command Seal’ finally answers but as we see in his first and last fight with Kirei, he has no hesitation in putting his own life on the line if it means a better chance at success for his goal – the good of the many trumping the damage done to his own health and well-being. That particular fight scene was perfect to begin the finale with; it had high stakes, incredible tension and built the energy of the episode up just in time for the Grail’s release. It seemed to me that Kirei went into the fight the favourite; between his innumerable Executor tricks, magical knowledge and peak physical condition, it seemed obvious that Kiritsugu would not be able to play him like he did Kayneth. Indeed, although the fight was fairly even throughout, it did feel like Kiritsugu was just one tiny misstep away from a painful, premature death – and that was even with the enormous benefit conferred by Avalon. I won’t spend too much time talking about this fight scene – I enjoyed it tremendously, it was exciting and entertaining to watch and an important part of the episode. As you might expect, what happens next is what totally fascinates me. Before we dive further into this discussion, however, I want you think about just how self-aware Kiritsugu is at this point. Has he always known that his methods, when taken to their logical extremes, were as flawed as they were revealed to be? Or did the Grail just expose that flaw to him for the first time? The difference between these two possibilities really determines how we perceive Kiritsugu as a character: was he someone who subconsciously suppresses his misgivings about a course of action, or is he surprisingly idealistic and sticking a method without thinking of its full consequences. I suspect it’s more of the latter than the former: he does truly believe that it is good to choose the majority over the minority but has never had to consider the broader consequences of such an approach. The scenario with the boats makes that clear; at each decision point, Kiritsugu sticks to guns (literally) and chooses to kill the minority but when he realizes that he has, in the process, killed more than he has saved, he regrets his decision, but the Grail accurately points out that his decision was ‘correct’ at the time he made them. This tells me that Kiritsugu has never stopped to consider whether, in the process of trying to do the ultimate good, he has done more harm. This philosophical quandary is not a new one; indeed, this has been one of several major criticisms of utilitarianism. 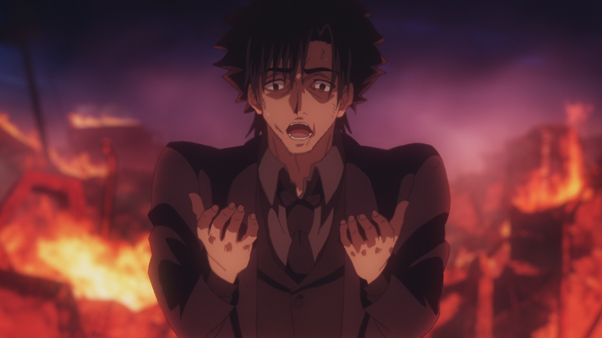 The criticism of Kiritsugu’s methods would have been one thing if the Grail itself had a way of overcoming it but the second body blow is dealt when it reveals to Kiritsugu that it cannot create a solution for his problem, but rather can only implement his own solution on a much larger scale. This particular reveal is excellent for two huge reasons; firstly, it firmly establishes the Grail as a tool for mankind rather than some kind of omniscient source of salvation. The Grail has been hyped up throughout the series as being omnipotent and in a sense, that’s true: it has tremendous power to implement but not the knowledge or wisdom to know how best to do so. In a sense, this is the series saying that the act of saving mankind and becoming a champion of justice isn’t the hard part, the hard part is figuring how to do that. Kiritsugu has been relying on the Grail to both create and execute this plan and that brings us to the second reason why this reveal is brilliantly done. All of a sudden, not only has Kiritsugu’s entire plan throughout the series gone up in a ball of flames (heh), now, the device that was the entirety of his plan is going to do what he considers the exact opposite of what Kiritsugu wanted it to do, all based on a malicious interpretation of Kiritsugu’s wish. It adds a sudden injection of tension because now all of a sudden, expectations have been reversed and the tale has been twisted. On an emotional level, everything that happens next is both satisfying and agonizing. The purpose of fiction isn’t just to entertain – it is also to make us feel. That is the reason why tragedies and horror movies exist even though sadness and fear are not emotions that we typically seek in our day to day lives. The challenge lies in not having suffering for its own sake and honestly, I’m not entirely sure that that is always the case with this series. In this particular couple of episodes, however, the suffering felt justified. It broke my heart watching Kiritsugu kills his wife and daughter with his bare hands though at the same time, I kept wondering why he was doing it. At what point does the reality of a loving family outweigh that vague, abstract notion of an ideal? At first, I simply could not understand Kiritsugu’s actions – what ideal could possibly be worth having to live with the knowledge that I killed my own loved ones? Then I thought of all the many men and women who have as much, if not more, throughout history in the name of either nationalism, patriotism, religion or some other vague, abstract ideal and while I still don’t see Kiritsugu’s personal ideologies as being worth giving up a wife and child for, I guess it says something about the character that he chose that for himself. It can be all too easy to forget that Kiritsugu is a damaged character, even by Nasuverse standards, and while I don’t think that means we need to give him a free pass on all his decisions, I do think that his past offer sufficient explanation for his actions, if only just barely. Once Kiritsugu learns the truth of the Grail, however, his decision to destroy it seems to me to be the only rational one left. The consequences of that rational decision are shocking and unexpected but it seemed to be the only move he could make. Once the Grail’s foul contents spill over the city, the man we knew as Emiya Kiritsugu no longer exists. The act of destroying the Grail, of course, has grave repercussions on the remaining characters, and none more so than Saber. Saber hasn’t played the biggest role in this series; that role has been occupied by Kirei and Kiritsugu, especially in this second half. Still, it seems that events have conspired to ensure that she remains as far from happiness as possible. Previously, we learned that Berseker was none other than the renowned Sir Lancelot of Arthurian fame and the Einzbern consultation extras give a little more detail into what their relationship was like. Let me start by saying this: Lancelot really has no business being a sympathetic character, but for some reason, he still is. This is a guy who essentially sleeps with someone else’s spouse, elopes with her, kills the comrades who come after him, is utterly lost to the concept of honour and then when he is forgiven by his King, resents him for not being harsher. It’s not the most sympathetic of backstories but there is something about the way that Saber has been portrayed – and I think this is specifically a Fate/Zero thing as opposed to a general Fate thing – that makes you sort of see where he’s coming from. It all goes back to Saber and her precious ideals. Were she just a little less perfect, a little less righteous and a little more human, the knights serving under her would have seen her more as one of them instead of feeling like they were always falling short of the perfect example their leader set for them. Is that Saber’s fault? Maybe yes, maybe no, who’s to say? It is, however, undoubtedly a weakness and one that Rider saw right away. It’s a toss-up between who got hit harder in this series finale, Kiritsugu or Saber. Both characters were broken down little by little until there was nothing left of their spirits. Saber was forced to confront the fruits of her labour when she saw what she had made Lancelot – now, I agree that saying she ‘made’ Lancelot is far too harsh, but that was the way she took it – and then when Kiritsugu forces her to destroy the Grail, she realizes that has even failed in trying to rectify her mistakes. Her final line in the series is absolutely heart-breaking: “I should never have become King”. 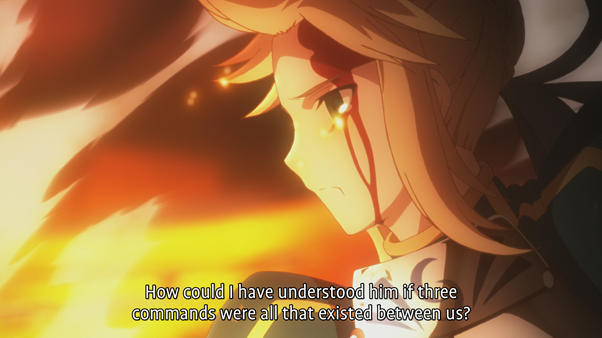 Her final sentiment ties in, if a little haphazardly, to her feelings about her position throughout most of Fate/Stay Night, though it’s pretty clear that the Saber Shirou encounters is different from this Saber in some pretty glaring ways. The list of characters that come away from this Fourth Holy Grail War better than they went in is unsurprisingly short, but actually longer than you might expect. ‘Fate/Zero’, the final episode dedicates a good amount of time to resolving Waver’s story but that is probably one of the weaker portions of the finale, right alongside, Kirei’s English funeral. Waver was never interesting enough on his to warrant much attention and in an otherwise, tightly written and well-paced episode, spending that much time on Waver felt unnecessary. The other characters that walk away from the War unscathed are Kirei and Gilgamesh. Funnily enough, had the series ended one episode earlier, I would have been sure that Kirei had died but the Grail brought him back for reasons that aren’t fully clear. Kirei’s ‘death’ was a notable scene because it was the first, and as far as I can remember, the last time that we see Kirei beg or express any sort of vulnerability. 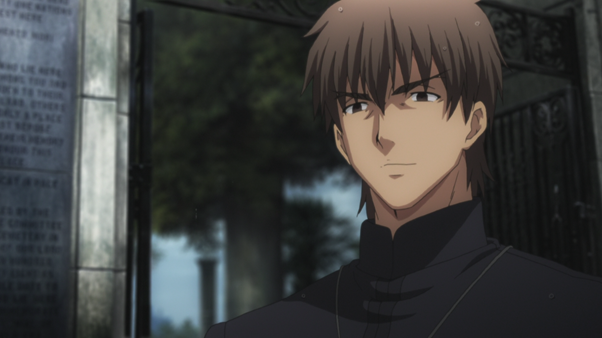 All throughout Fate/Stay Night even in the moments before his deaths, Kirei has a devil-may-care attitude, but when he is begging Kiritsugu for the Grail, it seems that he has found something that genuinely desires. I can’t remember if the lore ever covers this but was the unbeating black heart that Kirei receives a result of his wish to the Grail? It would seem that Kirei asked the Grail for answers about why he is the way he is but since the Grail can only provide answers and wishes that the wisher is already aware of, perhaps it granted Kirei’s wish by giving him the means to live on and discover the answer for himself. The only problem I can see with that is that Kirei didn’t ‘win’ the Grail but then again, once Kiritsugu rejected the Grail, perhaps it just moved to the next available Master to fulfil its desire to be born into the world. Kirei wastes no time using his second lease on life to savour the delicacy that is the misery of others, in this case, Rin. Gilgamesh, in the meanwhile, simply receives true incarnation, something that Rider sought as well. I’ve never understood why Gilgamesh spent the next ten years just hanging out with Kirei when he could have been out in the world savouring the pleasures of the modern era. If I had to guess, I’d say that Gil just found the modern world thoroughly lacking and thus just spent his time kicking it with Kirei and fantasizing about Saber. 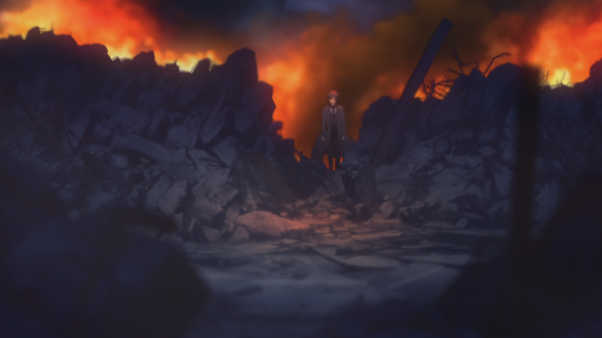 ‘Fate/Zero’, the final episode, was really mostly just an epilogue of sorts as we check up on some of the other characters and see how they are coping with the aftermath of the War. The Tohsaka household is particularly morose, with Rin trying to hold everything together and Kirei taking his usual sadistic pleasure at her grief. It turns out that Aoi is still alive, but is both mentally and physically disabled and it seems that it’s fallen to Rin to take care of the household. 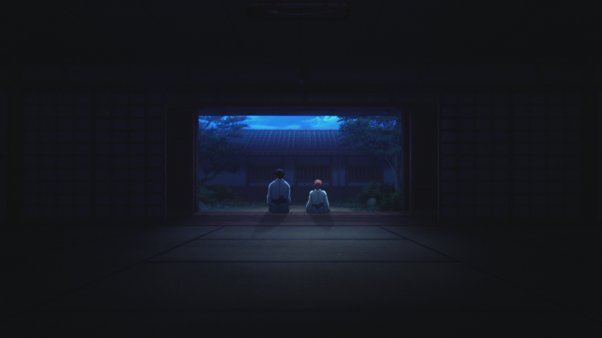 In the Matou household, all of Kariya’s efforts came to naught – even as he tried one final effort to save Sakura, all he managed to do was convince her that nothing good can come of defying Zouken. Kariya’s story is just really, incredibly unfortunate – every good intention he has had thus far has blown up spectacularly in his face and at this point, it just seems cruel of the story to make even his death become a moment of discouragement for Sakura. The epilogue also tells us that Kiritsugu tried to get Ilya back but we knew that that never happened though it was nice to know that he at least tried. I like how the series begins with Ilya’s birth and ends with Kiritsugu’s death; he starts the series full of reservations and bitter anger at the world but he ends it with his son, at peace in the knowledge that he has someone to inherit his dream. Thank you to all of you for following this series alongside with me. There will be a final, overall series review either this week or by the weekend (I promise) but beyond that I’m sorry to announce that I’m going to be taking a break from the blog for at least month while I try to sort my life out. My hours just got longer (though I’m being paid better for them) and between work, travel and studies, I don’t see myself having time to dedicate to this blog in the near future until at least one of those items drops off the list. If any of you have enjoyed any of the write-ups on this site, I would like to humbly ask you to consider making a small donation on Patreon. I’m not asking for your rent money figures, I’m asking for pocket change figures, McDonalds dollar meal figures. If not, just spread the word as always (Facebook, Reddit, etc) and I hope to be back in a while. In the meanwhile, check out this link for my next anime series, but remember, it won’t be up for quite some time (June at the earliest). Take all the time you need. It’s been fun following along with you and seeing you tackle the Fate series as a whole with the perspective of someone just jumping in. Reading about you trying to figure out Archer’s identity in particular was awesome. I love how much these shows got you thinking. You even went and played through the VN (which is something I haven’t managed to get any of my friends to do despite getting them interested in Fate). It’s been a joy to follow you through this franchise even when your opinions differed from my own. I won’t begrudge you a bit of time off. Do what you’ve got to do. I know where to find you, and when you come back with the next review I’m sure I’ll wander back. Thanks, that really means a lot to me. I’ve enjoyed watching these shows immensely and can’t wait to get back to it. I feel like a short break will keep me from getting too mechanical and keep me fresh, if that makes sense. Hope to see you back in June! Seems I’ve joined at a bad time, which is a bit unfortunate as I do like your style. You notice a lot of details that most people seem to gloss over, which is pretty refreshing to see. Anyways, when you come back you should add Puella Magi Madoka Magica and its sequel Rebellion to your list. It’s another of Gen Urobuchi’s works, and it would be interesting to see what you have to say about it. Pretty much, the Grail mud replaced his real heart. That’s why he can control the mud at the end of the Fate route and is able to survive True Assassin’s Noble Phantasm during the HF route. That said, I really enjoyed reading your analysis of Fate/Zero. Every week you did a masterful job with the run-down of the themes and your writing always feels fresh. Now that you have finished it, you’ll probably recognize who is that older teacher that briefly appears in UBW episode 25 and seems to know many things about Fuyuki’s Holy Grail War; you can also continue Fate/Strange Fake now, since there’s no more risk of spoiler. I don’t know if you want to take a break from the Nasuverse, but after Fate/Zero there’s the visual novel Fate/Hollow Ataraxia, sequel of Fate/Stay Night. 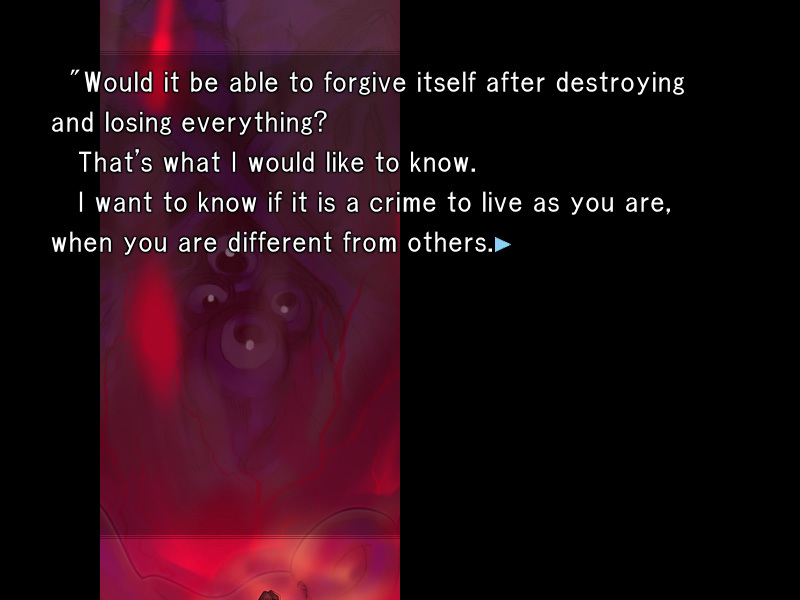 I’d really recommend reading it if you want to spend more time with F/SN cast and learn more about Angra Mainyu, in order to complete the puzzle started in HF and F/Z. I voted Psycho-Pass in the survey ‘cause I feel that it’s a compelling thematic continuation of what Urobutchi pointed out during Fate/Zero. Neon Genesis Evangelion is a close second because it’s really suitable for weekly reviews. Anyway, take all the rest you need, I’ll be here when you come back! Thanks for the refresher on the VN. I’m always really impressed by how you guys are able to remember all of it so precisely. I remembered TA’s NP not working on Kirei because of his heart but not him controlling the mud and I certainly forgot that line about Kirei’s motivation. I took a quick look at the survey results and while it looks like votes are still coming in, NGE seems to be by far the front runner. Thanks for all the support and hope to see you back in June! Oh and I did check EP 25 out of curiosity and I recognised Waver! I guess Travelling the world really did work out for him. Adult Waver is known as Lord El-Melloi II, a highly respected professor within the Mage’s Association and the main protagonist of the “Lord El-Melloi II Case Files” light novels. The character materials expand what happens to him after Fate/Zero. Kayneth’s sudden death leaves a gap in the organization of his research left at the Clock Tower, and House El-Melloi is left on the verge of ruin. While still considered Kayneth’s most useless formal student, Waver collects the unorganized and unattended works before they are lost, compiling them into the tome named “Lord Kayneth’s Encyclopedia of Arcane Secrets.” His actions restore the El-Melloi house, and he becomes known as the “man who revived the Archibalds” or “new El-Melloi.” The encyclopedia becomes what acts as the foundation for the flourishing of the house and its descendants. Waver takes on the title of Lord El-Melloi II, after the proper heir, Reines El-Melloi Archisorte, a young girl at the bottom of the family’s hierarchy, recognizes his achievements, but only does so while letting him know that Kayneth’s death was his fault and that he will have to serve her for his entire life. His works eventually cause him to be recognized as a great professor. He wishes to further his own studies, but his mediocrity as a magus keeps him from advancing. He attains a reputation as a great teacher, but cares little for it due to not even being able to advance in rank within the Clock Tower. He becomes the sponsor of Rin Tohsaka after she arrives in London to begin her studies. Ten years after the end of the Fifth Holy Grail War, he goes to Fuyuki and, together with Rin as the head of the Tohsaka clan, sets out to completely take apart the Greater Grail (still under the temple at the end of Fate and UBW, while at the end of HF it was destroyed). They are opposed by members of the Mage’s Association wishing to retrieve it instead, leading to great turmoil of the same magnitude as a Grail War. His side eventually is victorious, and the Greater Grail is completely dismantled, marking the conclusion of the Fuyuki Holy Grail Wars. Which did you enjoy more, Fate Zero or UBW? How about the VN? And to add to this what is the viewing other you would recommend after having seen some of the Fate animes. In terms of enjoyment, it would go VN, FZ and then UBW. There isn’t a huge gap between them but there is definitely a preference. I liked the VN the most because of the context it offered whereas the animes both left me (or in the case of FZ would have left me) very lost about the specifics. It might just be that I prefer reading to watching, since I can control my own pace. Between FZ and UBW, I think I’m biased because I just finished FZ and UBW was a while ago but FZ felt like a grander, bigger story. I would say HF>FZ>UBW>>Fate. As for order though, that’s much harder. I believe the VN has to come first but it’s such s hard sell because the beginning of Fate has so little going for it. On top of that, the VN is beginning to look very dated and newcomers to the series are going to care about that. I would UBW first, then VN if you’re interested in the mechanics of the universe and want to really dive in, or FZ if you didn’t really care for the specifics but enjoyed the themes and concepts. It would really be a shame for someone to not watch FZ because of UBW. First to address a question, the interpretation that the Grails acts are from Kirei’s desires are just that-his own interpretation of events, egged on by Gilgamesh, which he nonetheless takes to heart in his final descent toward utter amorality-the grail didn’t answer his wishes, since, as you noted, he didn’t win the Grail, Kiritsugu did. 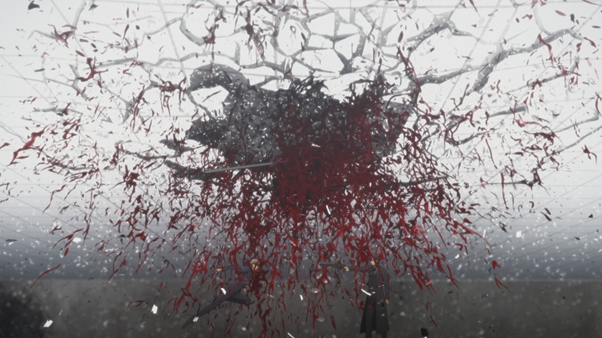 What happened is that when the Grails curses touched Gilgamesh, it was unable to corrupt him (in a scene that was cut, see here https://www.baka-tsuki.org/project/index.php?title=Fate/Zero:Act_16_Part_10 ) and therefore flowed instead, through their still existent master-servant connection, into Kirei, reviving him. As for why Gilgamesh stuck around the entirety of the 10 years I’d say he was waiting for the grail war though that doesn’t really require him to be there the whole time so who knows. So that aside I find myself in agreement with most of what you say here, especially on Kiritsugus character, especially his inner idealism and optimism which is brutally shattered by the grail’s reality of his ultimately doing more harm and the lack of an godly magical power to end conflict, making all those deaths he caused in the name of the greater good become apparently meaningless now. I think Wavers epilogue was meant to give a bit of light here-after all, the past few episodes have been nothing but happy, with the only two coming out having truly accomplished something they wanted being Kirei, who is a far cry from the moralistic and lost priest he was at the start and Gilgamesh, who is Gilgamesh-a bad guys win scenario, if you will. The last episodes really were an emotional rollercoaster, from Gilgamesh’s defeat of Rider to Kiritsugu becoming a broken man, Kariya ending up a complete and utter failure at everything he hoped for, and Saber going from wishing to a do over of her reign to wishing it had never been at all. It’s actually a little odd, with Saber, there isn’t in reality much of a time gap between the destruction of the grail and her summoning by Shirou, so she seems a little less emotionally distraught than one might expect-though I suppose in general, she seems less concerned with chivalry and whatnot and more consigned about life in general, with her wanting to erase her kingship entirely. 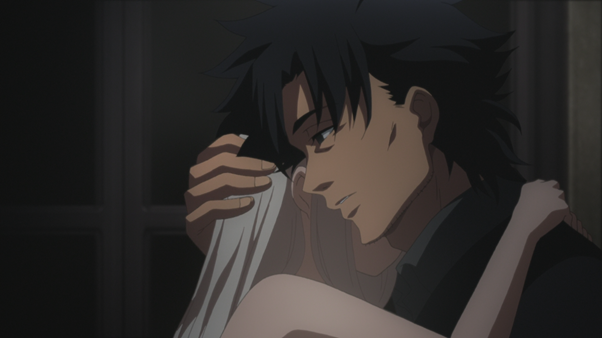 Nonetheless despite the general unhappiness, I think there is a bit of a positive message nearer the end-when Kiritsugu saves Shirou, and thinks that by saving at least one person, he had saved himself, leaves us off with a much less hopeless tone than there would’ve been otherwise. I’ll look forward to seeing your final thoughts and review, as well as your next series. I think you hit the nail on the head perfectly re: the difference between Saber in FZ and FSN. Saber I’m FSN doesn’t seem like a character who has experienced everything she did in FZ. NGE is one of my favourite series (well, so are some others on that list) so I certainly will. Sabers differences in characterization do get brought up frequently, but then does she act like she just lost her kingdom in the start of Zero either? Charitably Saber does act more suspicious of Shirou compared to Irisviel (though she seems equally permissive of both when they decide to do something strategically unwise) at least in the beginning not mentioning her true identity for one and in the path where he elects to abandon the Grail War she isn’t really surprised. This doesn’t really change until the dream cycle kicks in and she experiences Shirou’s memories of the fire vice versa. Still there’s no point in pretending that the events of Zero were written before Stay Night so it’s not like you’re imagining the inconsistencies. It seems to me like Kiritsugu was always aware of the flaw in his ideal which is why he went to the Holy Grail for a way to save humanity, and the solution the Grail gave back to him was his own. Anyways, i’ll be more than glad to donate to the patreon next week when I get paid, as of right now I don’t even have pocket change in my account. I’m really hoping Evangelion pulls through, although I think it will be a big race between Psycho-Pass and it. I assume if you select Eva, you’ll do the End of Evangelion movie right after? 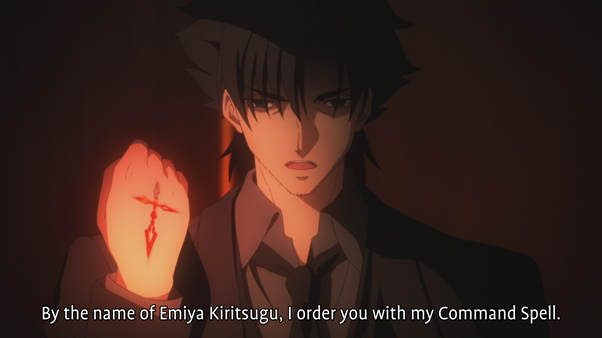 That is actually the reason why I personally don’t like Kiritsugu. His desperate attempt in getting the grail and his belief that it would help him was foolish rather than idealistic. The race isn’t as big as you think haha. NGE is winning by a long shot. I was planning on covering the original series from the 90s, didn’t known about the movies. Would you recommend a specific order? From the movies which GARm mentioned, only EoE has a direct relation to the tv series, being either an expansion/alternate telling of the original tv series ending, or an alternate ending all together, depending on who you ask, though it’s the only one that’s required viewing. Death and Rebirth is like he said mostly a recap, as long as you watch the Director’s Cut version of the tv series and EoE there’s nothing D&R will have you won’t have seen besides one mostly symbolic and allegorical scene that doesn’t really go anywhere. The Rebuild movies are Ostensibly a retelling of the original with a different story line. I personally would only really suggest watching the 90s TV series and then the End of Evangelion movie for right now since the Rebuild films are still being released and they’re spaced around 3-4 years apart. Death & Rebirth is absolutely unnecessary since it only serves as a recap of the TV series with the first 30 minutes of End of Eva added in at the end. It took me awhile (Jesus, an entire month went by! ), but I finally put my $3 monthly pledge up. Love this, keep ’em coming! Sorry for not commenting sooner on this, just been distracted by rl at the moment and not found the energy to comment. Agree on your comments and of those in the comments section overall on the characters, stuff etc. Let me as well congrats you on finishing your reviews of F/Z, it’s been a real pleasure following your thoughts on the show and putting forth my own comments and you responding to them. Congrats as well on getting more pay for your job and hope things there and on the education front are going well for you. If NGE is your next anime show to watch, then I am quite eager to see your thoughts on it and what you make of it, this is one of these animes that has been analyzed and copied to death. But It earned that for a reason and figuring out the characters and plot in general is very awarding. Though the series is difficult to watch later on if you have ever gone through depression or you find angst hard to watch.